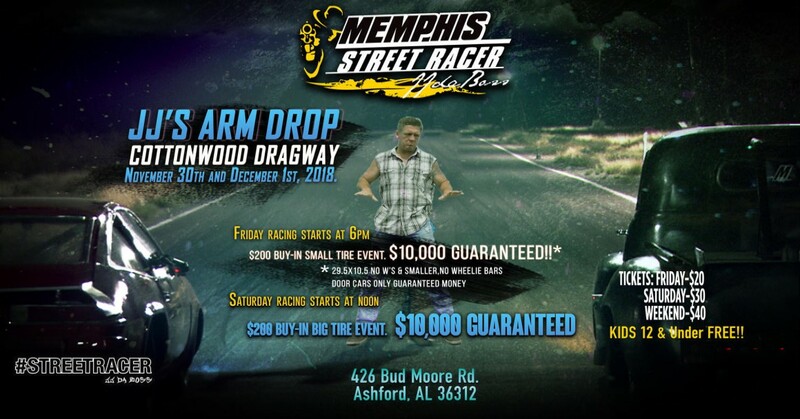 Come see JJ Da Boss and the Memphis Street Outlaws take on real street racers for real money on real streets. No BS. Just straight up street racing like it's supposed to be and you can be apart of it first hand. The experience is more than racing - it's a party with JJ daBoss. Bring your kids,lawn chairs, your coolers and be ready to have a good time and a lifetime experience. Small Tire Rules: 29.5 X 10.5 (No W's) and smaller. Door cars only. No wheelie bars. Arm Drop, Chase is Race, Water burnout only. Cross center you lose, first is worse. All crew must purchase a separate admission ticket. Entry allows for driver entry only. JJ has final say on judgement calls. Big Tire Rules: Door cars only. Arm Drop, Chase is Race, Water burnout only. Cross center you lose, first is worse. All crew must purchase a separate admission ticket. Entry allows for driver entry only. JJ has final say on judgement call. All ticket sales are final and no refunds.